Not to be confused with Notre-Dame Church (Montreal). The interior of the church is amongst the most dramatic in the world and regarded as a masterpiece of Gothic Revival architecture. The vaults are coloured deep blue and decorated with golden stars, and the rest of the sanctuary is decorated in blues, azures, reds, purples, silver, and gold. It is filled with hundreds of intricate wooden carvings and several religious statues. Unusual for a church, the stained glass windows along the walls of the sanctuary do not depict biblical scenes, but rather scenes from the religious history of Montreal. It also has a Casavant Frères pipe organ, dated 1891, which comprises four keyboards, 92 stops using electropneumatic action and an adjustable combination system, 7000 individual pipes and a pedal board. Approximately 11 million people visit Notre-Dame every year, making it one of the most visited monuments in North America. By 1824 the congregation had completely outgrown the church, and James O'Donnell, an Irish-American Anglican from New York City, was commissioned to design the new building. O'Donnell was a proponent of the Gothic Revival architectural movement, and designed the church as such. He is the only person buried in the church's crypt. O'Donnell converted to Roman Catholicism on his deathbed perhaps due to the realization that he might not be allowed to be buried in his church. The main construction work took place between 1824 and 1829. The cornerstone was laid at Place d'Armes on September 1, 1824. The sanctuary was finished in 1830, and the first tower in 1841, the second in 1843. On its completion, the church was the largest in North America. It remained the largest in North America for over fifty years. A new pipe organ was built in 1858 by Samuel Russell Warren. Inside of Notre-Dame Basilica (Montreal). The interior took much longer, and Victor Bourgeau, who also worked on Montreal's Mary, Queen of the World Cathedral, worked on it from 1872 to 1879. Stonemason John Redpath was a major participant in the construction of the Basilica. Arson destroyed the Sacré-Cœur Chapel on December 8, 1978. It was rebuilt with the first two levels being reproduced from old drawings and photographs, with modern vaulting and reredos and an immense bronze altarpiece by Quebec sculptor Charles Daudelin. Notre-Dame Church was raised to the status of basilica by Pope John Paul II during a visit to the city on April 21, 1982. The Notre-Dame Roman Catholic Church was designated a National Historic Site of Canada in 1989. On May 31, 2000, the provincial state funeral for former Montreal Canadiens superstar Maurice "Rocket" Richard was held in front of thousands, both inside and outside the Basilica. On October 3, 2000, Justin Trudeau gave his eulogy just steps from the High Altar during the state funeral of Pierre Trudeau, his father and Canada's 15th prime minister. It was also the setting of Celine Dion's December 17, 1994, wedding to René Angélil and hosted the memorial service for Angelil on January 22, 2016. Detail of the main altar. The basilica offers musical programming of choral and organ performances. It is a tradition among many Montrealers to attend the annual performance of Handel's Messiah every December at Christmas. The basilica now charges visitors CAD $8.00 for admission unless they are there to attend mass. "Aura" a sound and light show created by Moment Factory and unveiling the richness of Notre-Dame Basilica’s heritage is offered in the evenings, Tuesday through Saturday at 6pm and 8pm and Sundays at 7pm and 9pm. Tickets are $24.50 for adults, $22.20 for seniors, $18.75 for students [17-22] and $14.80 for children and young adults. The approximate duration of the show is 45 minutes divided into two parts: a thematic route followed by a multimedia experience. 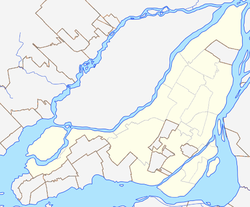 The closest Metro station is Place-d'Armes, on the Orange Line. ^ "Notre-Dame Roman Catholic Church / Basilica". Directory of Designations of National Historic Significance of Canada. Parks Canada. Retrieved August 15, 2011. ^ Notre-Dame Roman Catholic Church / Basilica. Canadian Register of Historic Places. Retrieved August 15, 2011. ^ "Justin Trudeau's eulogy". Canadian Broadcasting Corporation. CBC.ca. 2000-10-03. Retrieved 2008-08-28. ^ "Celine Dion and Rene Angelil's Wedding". Lovetripper. Retrieved 2008-08-28. Rémillard, François (1992). Old Montreal - A Walking Tour, Ministère des Affaires culturelles du Québec. Livesey, Herbert Bailey (2003). Frommer's 2004 Montreal & Quebec City, Frommer's, 104. ISBN 0-7645-4124-2. 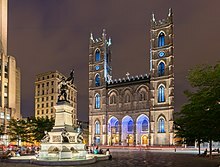 Wikimedia Commons has media related to Notre-Dame de Montréal Basilica. "The Old Seminary and Notre-Dame Basilica". Old Montreal Web site. Retrieved 2008-03-21.